The special analog spread display shows all continuous analog signals as well as segmented analog signals (generated using Multiple Recording or Gated Sampling option). In the spread display each signal has its own space showing all the signals stacked inside the window. Signals can be sorted and scaled and signals can even overlap each other. The spread display is very useful if a larger number of signals should be shown in one display window. As all signals have their own display space it is possible to see all signals at the same time without overlapping. 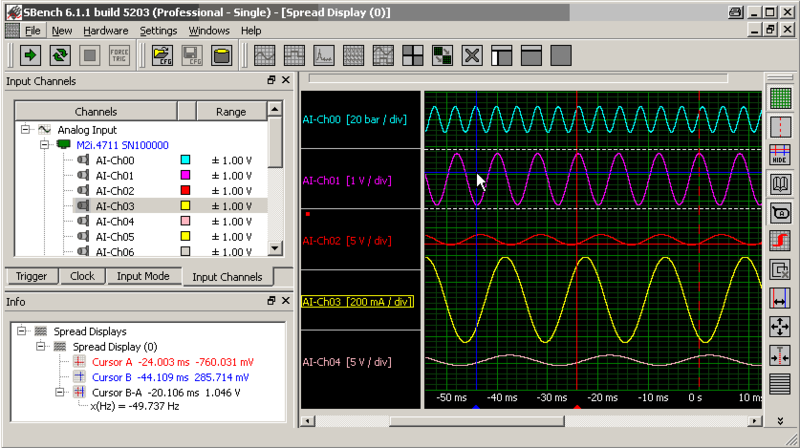 The y scaling is purely based on a unit per division scaling and the spread display can therefore handle a different y-scaling and y-unit for all signals displayed here. Signals can be scaled with the mouse wheel, Signal space can be changed with dragging the separator lines and signal sorting can be changed by simple drag and drop mechanism.